Established in July 2006 by Al & Nikki Wingate-Saul, we deliver high quality, local and fresh food to our very special customers. The majority of our meat in our butchery is sourced locally and it is all of the finest quality. From beef to pork, lamb and chicken and not forgetting our Dukes hill bacon which can be sliced to your liking. We ensure that those same meats have not travelled too far and have been reared with the highest welfare standards. We also rent out our hog roast machine, we will provide the machine, gas, pig/lamb and set the machine up for you for you to do your own hog roast. Whether you are looking for olives, decanted olive oil, jams or chutneys we have a mouthwatering selection. Not only do we provide some of the best coffees, we also offer a coffee grinding service in-house. 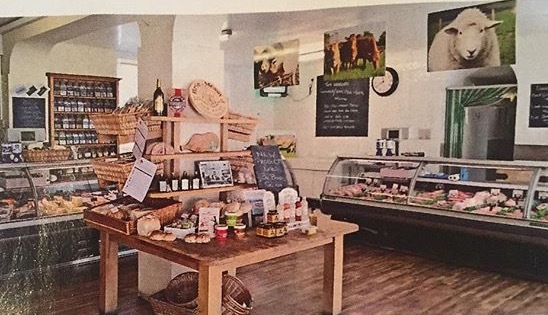 We have freshly made rolls and baguettes made on-site every day and we are able to make them to order from a variety of different fillings including our own cured hams, cheese, bacon, pate, tuna and many more choices; you would be hard pressed not to find something tempting in our delicatessen section. Do feel free to phone in a roll or baguette order and we will prepare it ready for your arrival. Coleslaws, celery and nut salads sit side by side with different ready meals each week, these can be lasagne, fish pie, chilli, cottage pie to name a few. A huge selection of local cheeses and a wide variety of cheeses direct from France. Our cheese counter boasts more than 30 varieties of cheeses sourced locally, nationally as well as from the Continent a real cheese lovers delight. Our home made quiches, and sausage rolls are a source of great pride to us and are exceptionally popular as well as our succulent and tasty home made meat pies and pasties (made using our own meats), a delight served either hot or cold. If you are looking for ideas to accompany a meal, you can’t go far wrong with our range of anti pastis and cold meats which are sure to compliment any menu. We have a selection of gluten free products and a selection of cakes and biscuits for those afternoon teas. We also have an area where you can sit and relax with a coffee or tea and a light snack right next to the window where you can watch the world go by.